This weekend is Franconia Day (Tag der Franken) again, so I thought this blog post should feature some Franconia pencils – in the wild. 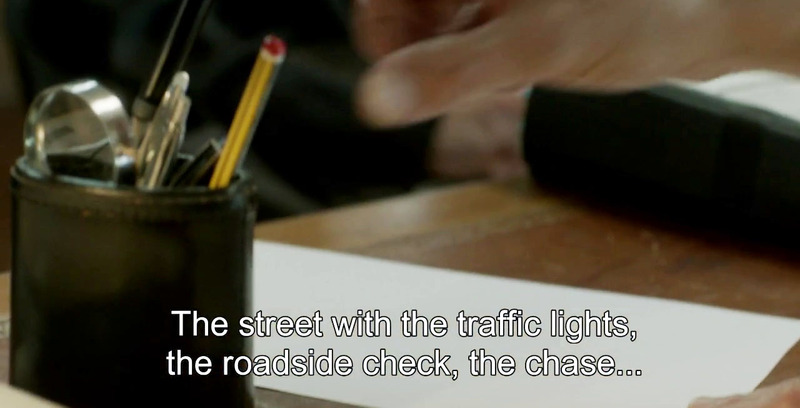 and Île-de-France where the pencils in the following pictures were being filmed. 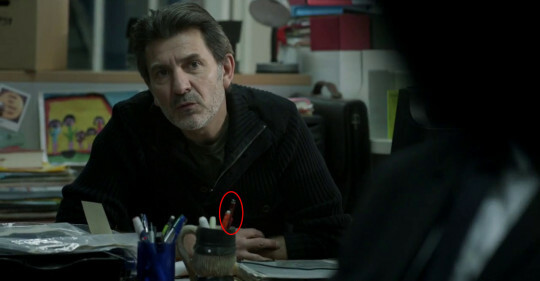 These screenshots have been taken from Engrenages, where they used to use the BIC Matic last season. Meanwhile, on the other side of the channel. 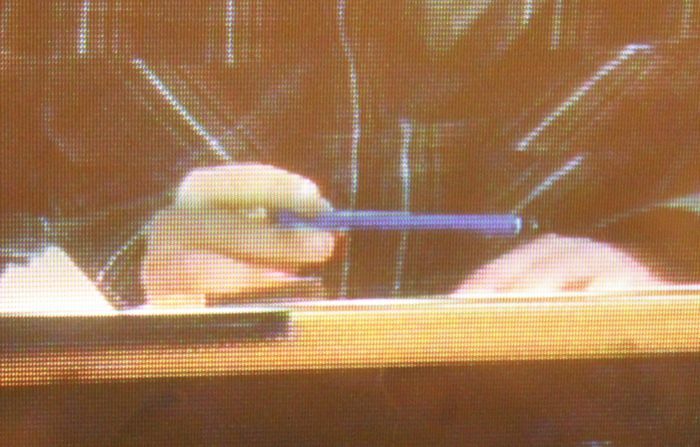 Actually, not meanwhile, but kind of 40 years earlier: MI5’s Alan Montag is using a Staedtler Noris. 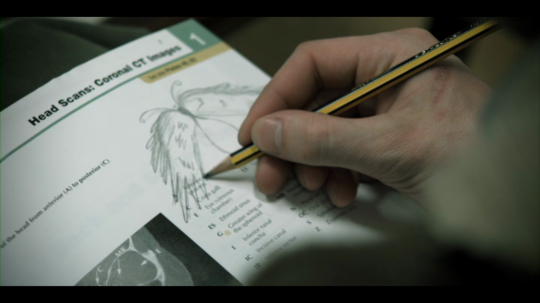 There are a lot of pencils in the series, but usually they are unidentifiable yellow/orange pencils. For a few minutes I thought Joe Lambe’s accent is Irish until I realised it’s one of the different types of Scouse2. The previous screenshot is from the great TV series “The Game” – from 2014, but set in the 1970s. In contrast here’s an MI5 pencil from the real 1970s – from the story Atout…coeur! / Hartkloppingen! 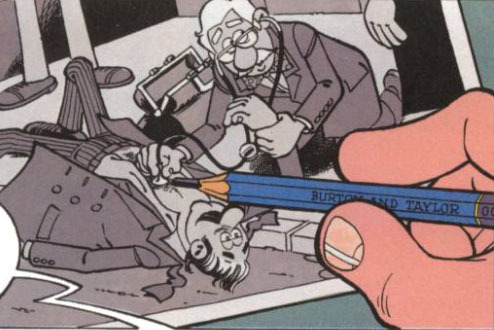 from Franco-Belgian comic series Clifton. 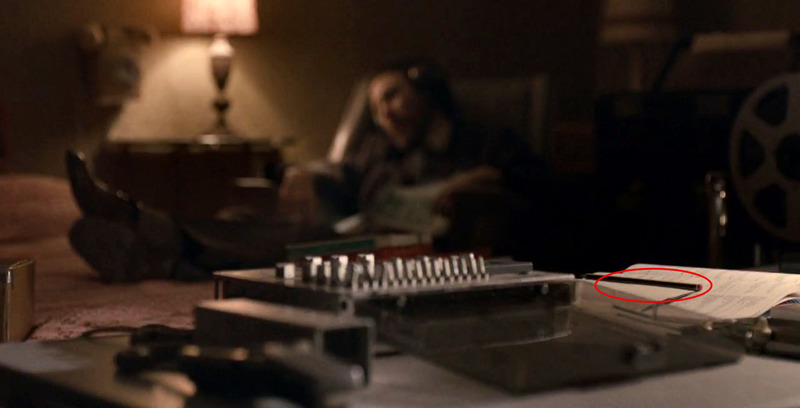 Burton and Taylor seems to be a reference to Richard Burton and Elizabeth Taylor, the design of the pencil seems to be based on the Staedtler Lumograph. After the BBC’s Make me a German this time: Make me Welsh. Funnily enough the TV series The Game I just mentioned was produced by BBC Cymru Wales, too. 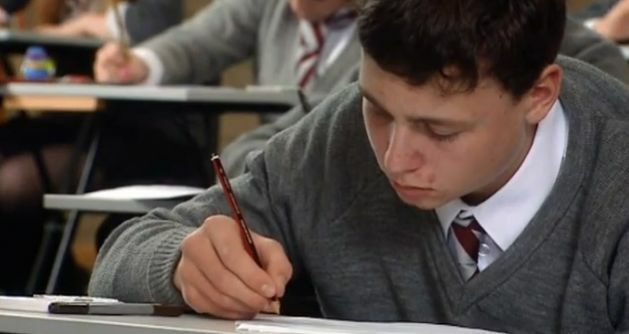 Sean told me about this programme and sent me a screenshot showing pupils using Staedtler’s Noris (very common in British schools). If that’t not enough Franconian pencils yet – there are plenty more in the latest season of Episodes. Episodes does again feature an extremely high density of Noris pencils per episode. I’ll skip the screenshot though as it would be virtually indistinguishable from the last one I posted. To celebrate what is probably my favourite pencil, the Noris, I have put together a page from the different Noris in the wild blog posts, which can be found here. I would like thank Sean for the Make me Welsh screenshot. I believe that the use of the screen shots, taken from Engrenages, The Game, Clifton and Make me Welsh falls under “fair dealing” as described by the UK Copyright service. The 100th post at Bleistift. I thought I should make an extra effort for this blog post, so there will be the first ever giveaway at Bleistift (oh, go on then, scroll down to find out more about the giveaway before you read the article). 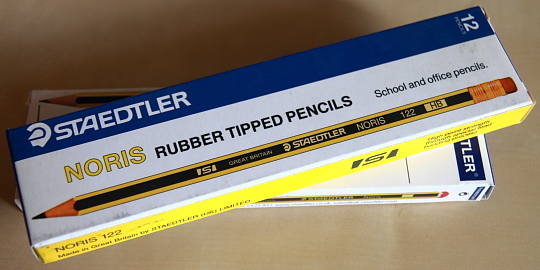 Today’s post will look at the history of Staedtler UK. It is a follow-up post to the Staedtler Tradition1 110 post from March 20102. The history of Staedtler in the UK seems to date back as far as 1796. 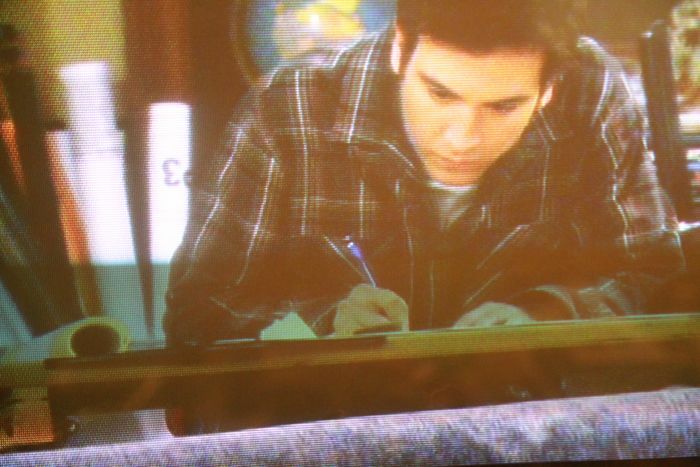 As far as I can tell this was the year when Elias Wolff, aged 15, started his career as a pencil maker. In 1822 he officially started his own company and by 1840 his son was on board and the name of the company changes to Elias Wolff and Son. The company was based in London, which is not surprising. The UK was and is very centralised and in the past graphite mining and production was controlled by the crown. Graphite had to be transported all the way from Cumbria to London, to be sold or auctioned. Soon Flemish traders were supplying graphite to all of Europe and the Society of Mines Royal asked the family of Höchstetter to apply their Bavarian mining techniques to make mining more efficient. Solomon Cohen, another pencil maker, was born around the same time as Elias Wolff. 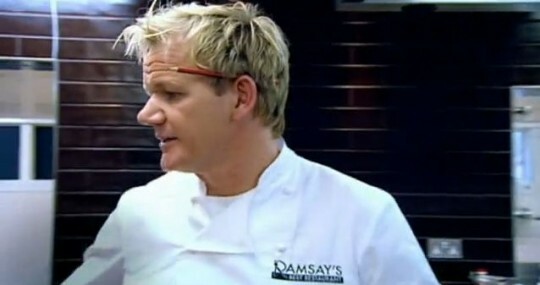 When his son Barnet Solomon Cohen took the business over he started trading as B.S. Cohen. 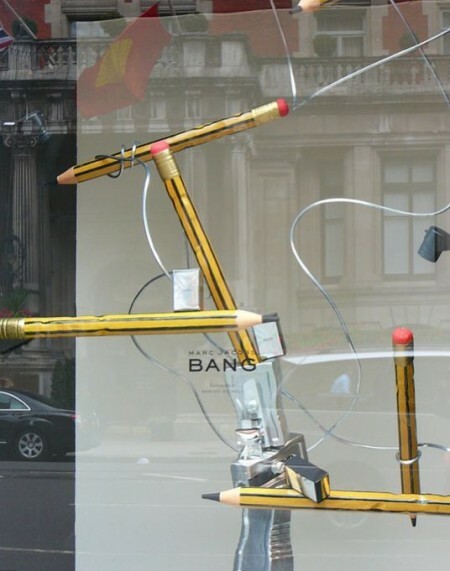 In 1919, at a time when England had some of the best pencil factories in the world, B.S. Cohen and E. Wolff and Sons merged. The name for the new company: Royal Sovereign Pencil Co. These were turbulent times. Elias Wolff and Solomon Cohen were born around the time of the French Revolution and worked as pencil makers while the war between Britain and France and the Napoleonic Wars were going on. Paulus Staedtler, another pencil maker, was born in 1779, in Nuremberg. Turbulent times there as well: Prussia took Nuremberg over before, in 1806, Napoleon’s army gave the city to their ally Bavaria – not long before all of Franconia was annexed to Bavaria in 1815. In 1835 Paulus’ son Johann Sebastian Staedtler started his own factory, the company we know today as Staedtler. The Royal Sovereign Pencil Co started life in 1919 and was renamed to Royal Sovereign Group Ltd in 1974, just before the factories where taken over by Staedtler. Strangely enough the names Wolff and Royal Sovereign never belonged to Staedtler. I have to assume that the new Royal Sovereign company only held on to the names and maybe some other intellectual property rights, not to any hardware. As far as I can tell, based on information provided by Companies House, the United Kingdom Registrar of Companies, the company was taken over in 1987. It took me a while to figure out that the company that took over the rights to the trademarks etc must be the Dickinson Robinson Group, a company that pioneered a number of innovations in paper-making in the 19th century. In 1989 this group was then taken over by Pembridge Investments, around the same time the rest of Royal Sovereign became part on Nontradorm, before the rest of the Royal Sovereign Group was officially dissolved in 1992. The names “Wolff” and “Royal Sovereign” do however live on. 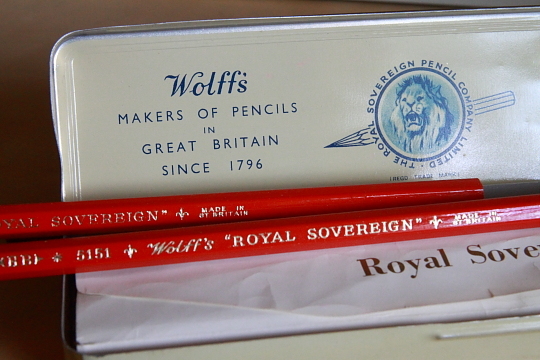 A family owned business, West Design Products, somehow got hold of the rights to the names Wolff and Royal Sovereign and sell Indonesian-made pencils under this name. A first attempt at contacting West Design Products nearly twelve months ago was unfortunately left unanswered, as was a subsequent attempt, so I was not able to find out how these traditional names came into their possession and whether their pencils are made in Staedtler’s Indonesian factory. In April 1966 Royal Sovereign started to produce two different types of Staedtler pencils in Pontyclun, Wales. 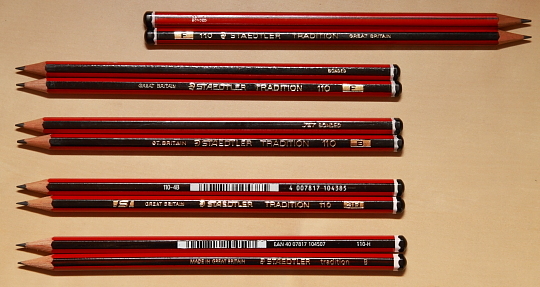 The early Staedtler Tradition 110 pencils made there had “RS – Bonded” printed on them. 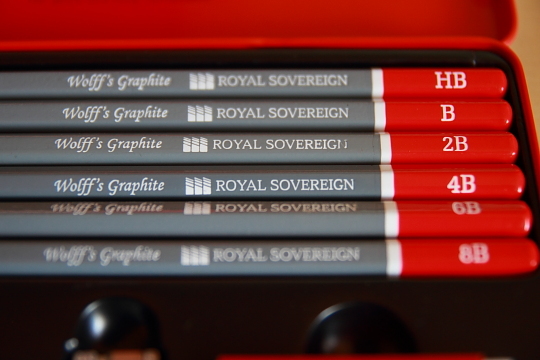 The factory still made Royal Sovereign pencils and they, too, had “RS – Bonded” printed on them. These early Staedtler Tradition pencils were pre-sharpened on the right side, i.e. looking at the pencil with the print facing up, the right side of the pencil has been sharpened. The RS Bonded version hexagonal, like all other Tradition 110s, and mainly red. 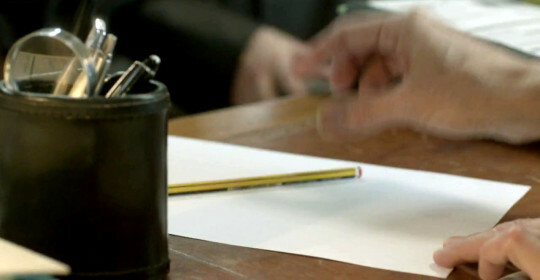 The cap has the typical Staedtler look, but only the side of the pencil with the gold letter print is painted black. 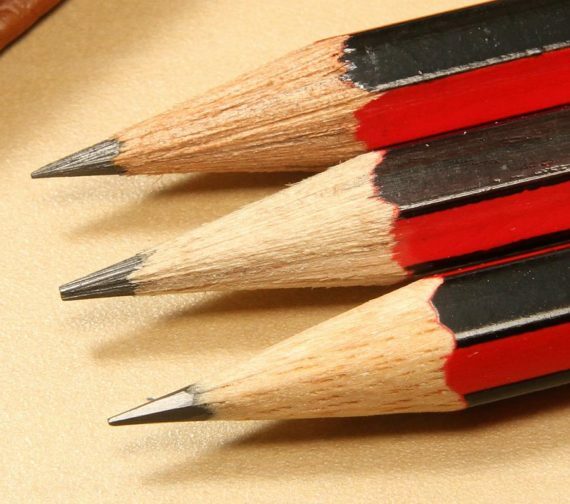 All other sides of the pencil are red with a thin black strip in the middle. The next generation of Welsh-made Tradition 110 pencils is pre-sharpened on the left, the same way as nearly all modern pencils. This means that the text on the pencil is not upside down if the pencil is held in the right hand, as was the case with the RS Bonded version. The black and red pattern changed, too, and is identical to modern Staedtler Tradition 110s. The side with the print and the opposite side are black. 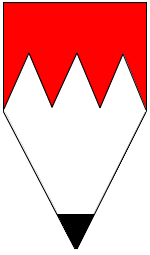 The other fours sides are red with a black strip between two adjacent red sides. For this generation the stamped text “RS Bonded” has been replaced with “Bonded”. The next generation of Tradition 110 pencils was probably released around 1972, a few years before Staedtler bought the factory in Pontyclun in 1975. This is the first generation of UK Tradition 110s, where the glue has been applied by a machine. Previous version had the glue applied manually. The print changed from “Bonded” to “Jet Bonded”. I am not sure whether there has been a generation3 of Tradition 110s between the previous Jet Bonded version and the next version that features a bar code. It is more than likely that this version of the Tradition 110 was released in 1990 or shortly after. You can still find the last generation of the Tradition 110 made in Pontyclun in some shops that have old stock. This generation was in production until the factory was closed in 2007/2008. 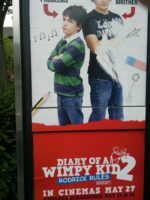 Around the same time, in 2008/09, the rest of Staedtler UK moved to nearby Bocam Park, about five miles West of Pontyclun. 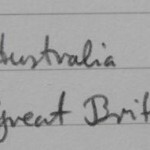 Royal Sovereign had two factories, one in Pontyclun, South Wales (UK) and one in Sydney, New South Wales (Australia) and when Staedtler took over they bought both factories. Unfortunately, the one in Dee Why (Sydney) closed down nearly 40 years after it opened, around the same time as the one in Pontyclun. Another Staedtler plant that was closed shortly after was the one in Pahang, Malaysia. Products previously manufactured in Australia and Malaysia are now made in Thailand (pens) and Indonesia (pencils). It is a real shame that these factories had to close down. Pencils can last a long time. 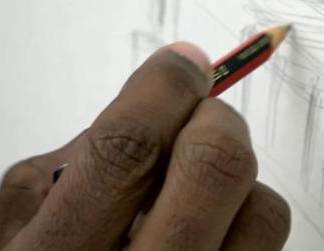 On several occasions I took a whole day worth of notes using a Staedtler Mars Lumograph F without having the sharpen the pencil the whole day. In comparison some other pencils wear down really fast, a Dixon Ticonderoga for example, or most of the Korean pencils I know4. Even the ones that wear down fast are usually good value for money, the ones that last longer often cost a bit more, but are even better value for money. In a time when many consumers will buy the cheapest pencil they see in the supermarket it must be difficult for the established, high quality pencil manufacturers to keep smaller factories and factories in high wage countries alive. I hope that in the future consumers will not just buy any old, scratchy pencil, but a good one, so that these factories can stay open as long as possible. I hope you enjoyed reading this post. There was more I wanted to include, but this post starts to get a bit too long, so I will write more about Staedtler’s popularity in the UK another time. If you have further information about Staedtler UK’s history or pencils, not mentioned here, or if you find any mistakes please let me know. After I heard that Staedtler’s Welsh factory closed down I started buying pencils from this factory in different shops. To celebrate the 100th blog post I am giving away three prizes, they are not worth a lot (check penciltalk’s anniversary post: How much is my pencil worth? Probably nothing! 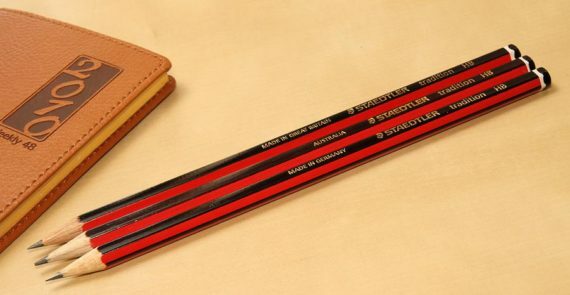 …but they were made in Staedtler’s UK factory in Pontyclun). I am happy to send the prizes to any country as long as Royal Mail doesn’t refuse to send them there. I will use random.org to get a random number and the author of the corresponding article will get the price (unless I am the author or the comment is definitely spam, e.g. 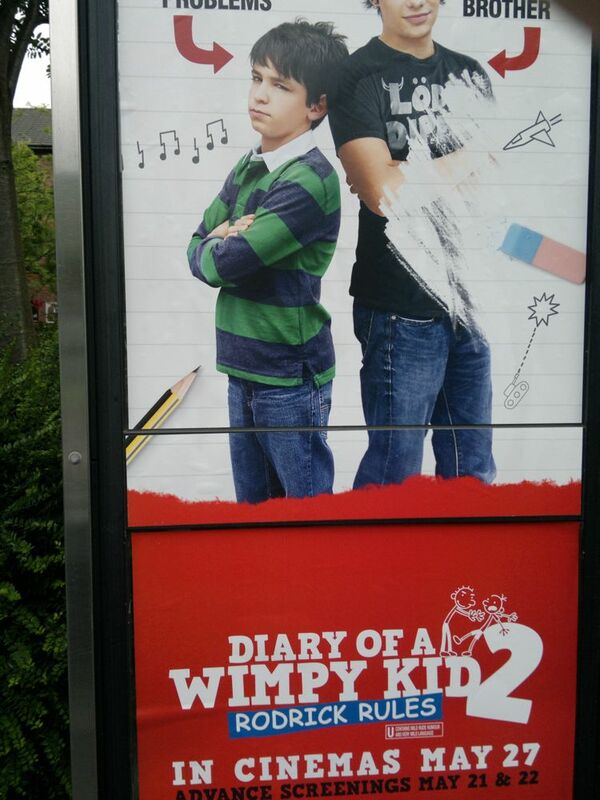 advertising for medicine, …). To take part please leave your comments before Friday, 8th July, 23:59 UTC. I bought West Design’s Wolff’s Graphite Sketch Set in September 2010 from Granthams in Preston for £4.25 (~ $6.80; €4.70). The Sketching pencils set with six pencils (B – 6B) used to sell for £1.70 (~ $2.70; €1.90) in Granthams and for £3.70 (~ $5.90; €4.10) in Paperchase. All the old Staedtler Tradition 110 pencils are from shops in and around Lancashire. The oldest ones are from a corner shop about 200 yards from my home. 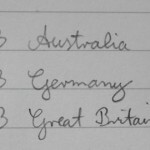 Lexikaliker has a blog post about another Staedtler UK pencil. Stationery Traffic has a blog post about the Tradition 110 and about another Staedtler UK pencil. I would like to thank my colleague and business historian, Dr. Mitch Larson, who gave me very useful information and suggested contacting Companies House, a registrar I hadn’t been in contact with for ten years.